Transmedia storytelling uses different ways to circulate and exchange information between media properties. It not only shares and integrates information on various platforms to gain more popularity, but also improves media’s cooperation, coexistence, interaction and coordination. Current technologies provide distinct and diverse forms of media and the same story is usually delivered on every media channel from an unique perspective and form, example include but not limited to radio, television, newspaper and Internet etc., among which Internet has achieved it’s priority due to its enormous amount of information capacity and convenience to the audience. Since most traditional communications media including telephone, music, film, and television are being reshaped or redefined by the Internet, most media use Internet as an important component to build their transmedia storytelling framework. 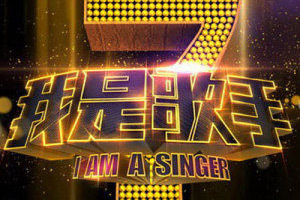 In China, I am a Singer has become one of the most popular TV shows on the air. This TV show is extremely hot that you can hear Chinese people talking about it everywhere, not matter on their private parties or during work time in corporation conference. I first knew the show from Sina Weibo, a Chinese microblogging website, where I am a Singer has an official account registered in order to promote its brand, communicate with audiences and update the latest status about the singers through microposts such as short sentences, individual images, or video links. Later after I saw some of the live videos posted on Weibo, I was deeply attracted and started digging more information on the show. The official Weibo website of I am a singer introduces the show in a comprehensive way and uses combinations of pictures, HD digital audios from the show, interview with the singer and even gossips and grapevines of the producers. 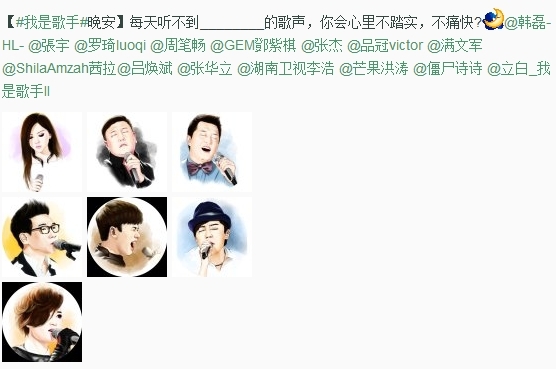 The following print is a screenshot from I am a Singer‘s Weibo homepage, as it shows those Chinese stars who has joined in the show, and you can see that the official account has attracted more than 16,294,557 fans (left corner middle column), and now I am one of them, excitedly opening my eyes wide to expect any updates from the show. In addition to the official Weibo website for the TV show, I am a singer also has a post bar, a combination of forum and bulletin board, for netizens to post whatever they like regarding to the show. In the post bar, you can see many people have different viewpoints and express their opinions and put comments in it. Even it has many advertisements about other shows and movies and some of the participants’ gossip, it’s still relatively regulated and everybody enjoys the platform it provides. Personally speaking, I think the Weibo account is more useful to the show than the post bar since it tells more about the show other than personal opinions. The picture below shows some information of the post like the first is an advertisement about the sales of the tickets and the second is a gossip on one of the show’s competitor. Comparatively, the Weibo website doesn’t have this type of information, and it just put official messages regarding the show. In China, Spring Festival Gala, which is also called CCTV New Year’s Gala, is special show broadcasted by China Central Television in the evening of Chinese New Year. The gala has a long history; it was first broadcasted in 1979 by CCTV and after that, it was shown in every Chinese New Year eve. The broadcast has a maximum of 800 million viewers watching it on the same time, making it one of the largest audience-owned entertainment shows in the world. Almost every Chinese considers it as a necessity in the New Year’s Eve and people are used to watching the gala while they are eating a big dinner with the family members so that they can share their happiness together. The Wikipedia website shows that this subject is written in seven different languages, and for each language, it has several hundred revisions and each revision is written and edited by users all over the world. Take the Chinese version for example, there are 390 edits and the first edits was started at 2005 and the most recent edit was made in February 12 2014, which is right after the Chinese New Year’s eve. Although the Spring Festival Gala is a traditional Chinese New Year event, people in foreign countries are interested in it as well, such as people who speak English as their native language; they contributed almost the same number of edits as Chinese users did. The English version has a number of edits of 307, which is just a little bit smaller than that of the Chinese version. And the most recent edits was even made earlier than that of its Chinese counterpart in February 6, right after the Chinese New Year Gala was broadcasted in 2014. 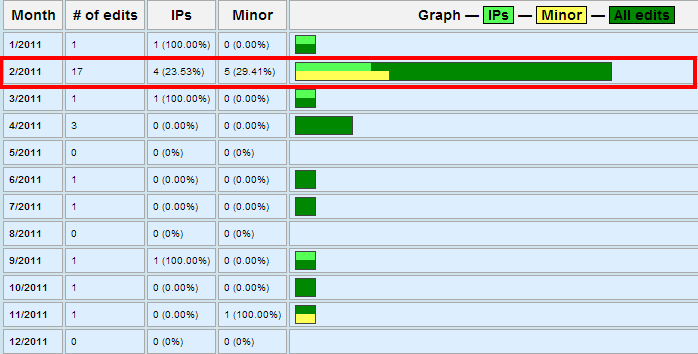 Even there are thousands of people edited on the subject of Spring Festival Gala in the Wikipedia, most of them contributed only once or a few times, but some of users did have more interests and professional knowledge in this topic and thus donated more revisions than the others with a high frequency. For example, there is a user named “Colipon”, who is the first editor starting the subject of Spring Festival Gala in January 03, 2006, and he spent more than 1 month to develop this virgin land. Chinese New Year usually takes place between January and February, depending on the Chinese calendar, so does the Spring Festival Gala. When the gala is being prepared during these mouths, people will naturally talk more about it and are inclined to have different views on it. This is reflected on Wikipedia as well. 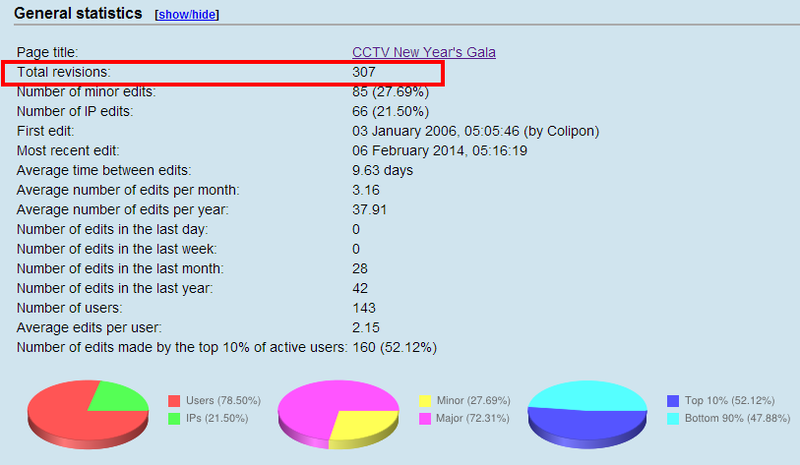 Refer to the following screenshot, we can tell that in February, when the gala took place, a lot of users were get involved in editing it and if we take a look at different revisions, we can see that people evaluated Spring Festival Gala in various ways, usually accompanied with the users’ own opinions, not objectively. Per “What Wikipedia Can Teach Us about New Media Literacies”, Henry Jenkins talked about collective intelligence and why Wikipedia is a perfect example of the concept and I strongly agree that, arguing Wikipedia is a carrier of collective intelligence. In his article, collective intelligence is defined as the ability to “pool knowledge and compare notes with others towards a common goal” (Jenkins, Part 2) and I think the Spring Festival Gala subject on Wikipedia is a wonderful reflection of this definition, on one hand, people all over the world work on the same topic on a stretched axis of time, they share their knowledge and make progress together, and on the other hand, due to the fact that different people have professional knowledge in various fields, some people may contribute more than the other, in frequency and depth perspective. Because of these, Wikipedia is more likely to be a good source for reference and study, other than a reliable source to cite on professional research. Wechat is one of the most popular mobile communication services in China, developed by Tencent Holdings Ltd in October, 2010. The beta version was first released for iPhone users in January 2011 and then more features were added gradually. Wechat was originally designed as a mobile terminal to link QQ, the most popular instant message tool in China, so that clients can easily imports the contacts who know each other, but then it turns out that more and more people are more willing to accept Wechat as a replace of QQ and just in a couple of years, it became the new hotspot and saw a humongous increase in the number of users. 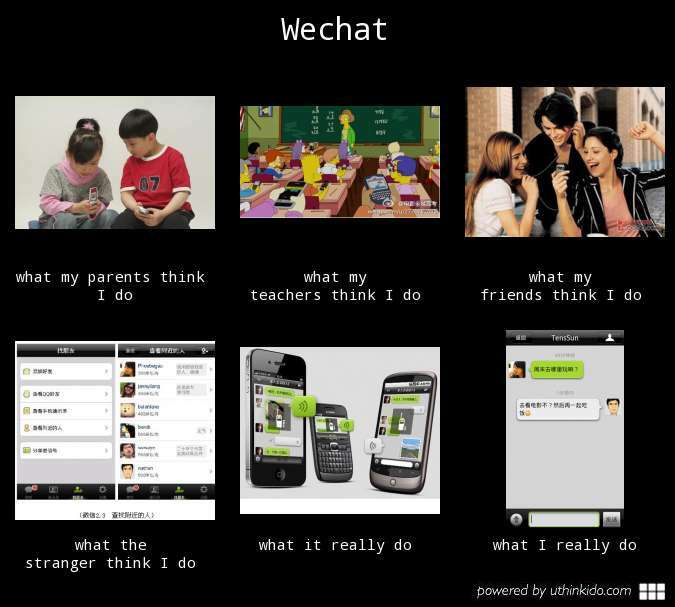 Wechat has several strikingly visual features that echo first stage of Onian’s stages of amazement leading to learning. Besides the regular features an IM service contains, it can transmit instant audio and video messages, and search someone who are close to you, and if you shake your cellphone it finds the people who shake the phone at the same time, MoMents like facebook is a social networking service and CurrentBottle helps you chat with strangers as an old friend. All these amazing functions whirlwinds the young people quickly. However, when Wechat gets real popular, per Onian said, “a consequent physical paralysis” emerged (Gunning, p41). People get used to it, people treated it as a routine business and even nobody realizes how and when it became the vogue. Different groups have attitudes by no mean alike due to their understanding and master of the tool, “the mental reaction which results in something being learned” is quite unlike and thus the “actions” people take on Wechat are distinct (Gunning, p41). Men usually use Wechat to hook up women, and women use it to promote sales of cosmetics, and since there are rumors about people using Wechat to defraud, extort or even trafficking by cheating, parents and seniors more care about the safety of kids’ who use it. But due to the fact that teenagers like Wechat and have a strong curiosity about that, they play it in classes anyway. What it really does? From my perspective, it’s just a communication service that combines different technologies and brings people greater convenience. I am using it every day and will continue being a loyal customer. By September 17th 2012, Wechat had 2 billion customers all over the world, and by January 15th 2013, it had put a big influence on Chinese mainland, Hong Kong, Taiwan, Southeast Asia, and overseas Chinese communities. In restrospect, the reason Wechat became popular seems to be more coincident rather than doomed, it’s designed as an affiliated helper of QQ, just as “Phonoscope, one of the first attempts to interrelate sound and motion pictures and first intended as for the instructions of the deaf in the techniques of speech”, not intended but developed awry into a direction that everyone are excited to see (Gunning, p52). Wechat makes my life more and more convenient now, because of features like video message save the money which I would have spent on the phone call, and the free entertainment service it provides fills my life with happiness. All in all, Wechat is spreading and more and more people cannot leave Wechat in their daily life.